OUR ON-LINE CATALOGUE is designed to give you as much information as possible. You will clearly find shown the name and the size of the house, the nearest town where there are shops and services, the surface and its location on the map. It is important to read carefully the description, which describe firstly the general information and then the exact details of each house / apartment. NUMBER OF BEDS. For each house is clearly indicated the available number of sleeps, bedrooms and bathrooms. The number of guests should not exceed the maximum number shown, except for babies up to 3 years old for whom guests supply their own cot and linen or make the necessary request at the time of booking to rent it on site. ARRIVAL AND DEPARTURE. Arrival is normally in the afternoon between 3 p.m. and 7 p.m. If guests for whatever reason are going to arrive later than this time, they must telephone our office, number +39 0575 845348, or +39 335 7604638 to arrange the late arrival. In order that the house can be prepared for new arrivals guests must depart in the morning between 8 a.m. and 10 a.m. Arrivals and/or departures on different days than indicated on the reservation must be notified in advance. ROADS Due to the type of terrain to be found in Tuscany and Umbria, often hilly and very steep, a lot of roads are not asphalt. Many could be difficult to pass through especially with low slung sports cars. Apart from this the area of Valdichiana is extremely well served by a network of good roads, both national and local, which put all the most important art centres, towns and cities of Central Italy within easy reach. FURNISHINGS AND EQUIPMENT. All houses are furnished according to the individual owner’s taste and have sufficient equipment to guarantee a comfortable stay. Cutlery, plates and china vary according to the standard of the house. In the most of the houses you can find washing machine, dishwasher, Satellite TV and other small electrical kitchen equipment such as toaster, kettle, microwave etc… but it is necessary to check the descriptions and the equipment of every house to be sure they are available. WATER, ELECTRIC LIGHT AND GAS for bathroom and kitchen use are always included in the rental price. Electric power (3Kw at 220V) is more than sufficient for normal use, but it is better to pay attention to don’t switch on to many electrical equipment at the same time otherwise it may occur a blackout. The most of the houses have independent wells so the water supply generally causes no problems. Some houses are connected only to public mains and in especially hot and dry periods the supply may be restricted. BED LINEN AND TOWELS. In most houses the cost of bed linen and towels is included in the rental price. Where the cost of bed linen and towels is not included this is clearly marked in the price list. Guests may either bring their own bed linen and towels or order them at the time of the booking paying 12,00,- EURO per person for each change of bed linen and towels. CENTRAL HEATING: the cost for the use of heating for almost every house is not included in the rental price. The cost can be found in the price list. For rentals from October to April we recommend those houses with central heating since during this period the heat from stoves is normally insufficient. AIR CONDITIONING: rarely the houses are endowed with air conditioning. But when you rent a country house with large stone walls, if you are attentive to keep windows closed during the hot summer days, it is quite easy to maintain a pleasant temperature inside. FINAL CLEANING. For most of the houses the cost of final cleaning is not included in the rental price and guests must pay directly to the house owner the amount indicated in our official price list. In any case where payment for final cleaning is not obligatory guests must make sure that the house is completely clean before leaving, paying particular attention to the kitchen. Where final cleaning has not been satisfactorily carried out the house owner has the right to deduct 12,00,- EURO per person from the breakage deposit held by them. PETS: in the most of the houses pets are welcome. At the moment of the reservation the customer must inform EuroCasa the eventual presence of a pets and the number. In some cases it will be required an extra cost for cleaning which will be indicated in the price list, to be paid directly to the owner on the spot. The customer must look after his/her pet in order to avoid possible damages or to disturb other guests. HOW TO BOOK: you pick a home, the booking process is very simple, you can book on-line directly into the site www.eurocasa.com 24 hours a day and from all around the world, or send an email specifying the name of the house and period to book and all the details of the person making the booking. Upon receiving the inquiry EUROCASA will book the villa and will send a booking confirmation with all the details to make the payment by bank transfer or credit card (Visa or Mastercard). A 30% deposit is required at the time of booking and the 70% balance must be paid 45 days prior to arrival. Any eventual COMPLAINT must be made in writing to the office of EUROCASA, within 48 hours from arrival. Complaints not in writing or not made within the time limits above cannot be considered. Where a complaint is received within the terms above the client must allow EUROCASA sufficient time to resolve the problem. When a client does not follow the above procedures and leaves the property rented by him before the end of the rental period he does so at his own risk and forfeits any right to eventual compensation for hotel rooms, other accommodation or any other expense incurred. In the case of any disagreement the competent authority shall be the Court of Arezzo. RESPONSIBILITY. EUROCASA operates as a tour operator and cannot be held responsible for any direct or indirect damages such as accidents, theft, etc .. that might happen to renters, their relatives or to the properties during their stay. 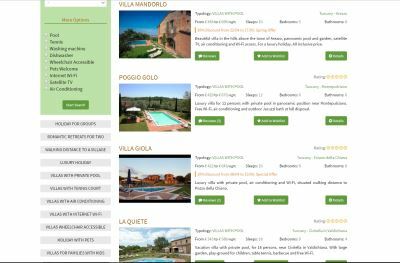 All the people who use the site www.eurocasa.com are personally responsible for the outcome of their research. Persons wishing to rent a property are responsible for the verification of the general conditions. EUROCASA is the 'intermediary between the owners of the accommodation and the people who want to rent it. EuroCasa has taken out public and private liability policies with leading insurance companies. The following is an extract from these. Only the original policies that are held in our offices are legally binding. Full details can be had on written application. 1. Policy with REALE MUTUA DI ASSICURAZIONI, Perugia Branch Office. This guarantees the public liability of Euro Casa whilst carrying out their legitimate business as Tour Operator during which they organize and manage vacations and stays in Italy. This policy conforms to European Community, Italian and Region of Tuscany law as follows: - Law #CE 90/314 of 13.06.1990 and Republic of Italy law #1084 of 27.12.1977, both of which are in accordance with international convention covering vacations and journeys (CCV) - Region of Tuscany law #16 of 08.02.1994 modified by law #79 of 19.07.1995 and #42 of 23.03.2000 The policy is valid worldwide. 2. Policy with REALE MUTUA DI ASSICURAZIONI, Perugia Branch Office. This guarantees clients and the buildings they use during the period of their vacation. Damage caused by clients to buildings. For accidental damage including to any systems and/or gardens the policy covers the owners of the property (except for damage to furniture and furnishings). The client also forfeits all money deposited as guarantee against damages and loss as detailed in our price list. Damage caused by clients to furniture and furnishings. For such damage the policy covers the owners to a maximum of € 5.000. The client also forfeits all money deposited as guarantee against damages and loss as detailed in our price list. Damage caused to the client. Public liability damage for owners of the properties in which clients stay, which includes damage caused by systems and/or garden and the general contents of the property is covered. The policies described above provide for the Companies issuing the policies to cancel the cover provided after all damages incurred have been paid. In case of dispute only the originals of these policies written in the Italian language are valid.